Sugar…what does it really mean? Making an informed choice at the grocery store can be confusing with all the marketing noise that tries to persuade you into believing one product is better than the other. The latest trend to hit the market is the claim about sugar and its health benefits (or lack thereof). 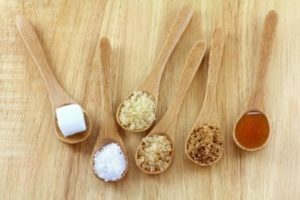 There is no sugarcoating the truth that large quantities of sugar is unhealthy and that is why this trend toward labelling our products as ‘natural’ or ‘sugar free’ has gained momentum in recent years…but what does it really mean? There are 5 key labelling techniques that are used on your food items and we’ll break them down for you one by one. Don’t be fooled by this product label. All sugars are considered natural unless they are clearly labelled as artificial. Yes, this means that white sugar is also natural as it comes from the sugar cane plant. Keep this in mind on your next shopping trip as labels are misleading. You will often see this label on fruit juices or raw treats and, while they are factually correct, this doesn’t mean there is no sugar at all. Other sugars including fruit sugars (e.g. fructose), honey and maple syrup are often found in these food items. They may be located in the health food isle but that doesn’t always mean their healthy. Cane sugar has been given a bad rap lately and hence the trend toward labelling products with ‘No added cane sugar’ is on the rise but this claim refers only to white sugar or added sugar. Again, be wary of other sugars making its way into these food items and strike this claim off by always reading the label. Looks can be deceiving with this label. ‘100% sugar free’ often refers to chewing gum or diet soda which is artificially sweetened but it may also refer to other products containing sweeteners such as rice malt syrup or honey. Be sure to look at the ingredients on the back label to be 100% certain it is sugar free. A product that is labelled with 50%less sugar is, more often than not, compared to another ‘standard’ product. Muesli bars are notorious for making this claim and it is usually compared to the standard muesli bar of the same brand. Most products with high sugar content such as lollies, soft drinks and cordials are labelled in this way to make you believe it is a healthier choice.